GBH Design is an independent, medium-sized company that is committed to planning and manufacturing extraordinary and exclusive lift systems, shaft structures and lift components according to customers‘ requirements. The individual and special lift systems are designed and manufactured in the small Bavarian town of Vierkirchen near Munich and from there delivered all over the world. In compliance with the applicable regulations for elevators EN 81 and the provisions of national or local authorities, and with regards to technical feasibility we do our best to realize almost every customer’s lift request. Lift construction is our passion. This is why our customised designs result in one-in-a-kind products and genuine works of art. 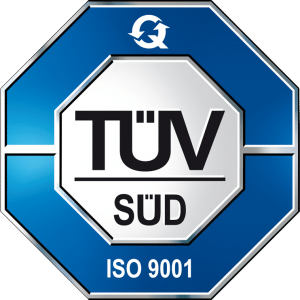 GBH Design is certified according to ISO 9001:2015 quality management and follow the EU Standard 2014/33/EU. Additionally, we are committed to sustainable environment protection, the Code of Ethics and Conduct. Our lift systems meet the highest requirements. The same comes true for our materials, components and finishing. Design, technology and products are „Made in Germany“. Our lift systems are constructed in compliance with the current lift standards EN 81 and the provisions of national and local authorities. 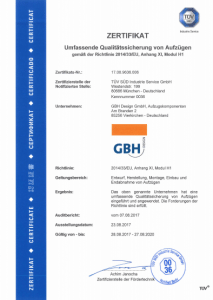 GBH Design is certified according to DIN EN ISO 9001:2015. GBH Design follows a Code of Ethics that obliges senior executives and employees to ethical conduct, so that we are able to reliably fulfill our obligations towards our customers and the society. GBH Design is operating all over the world whereby we observe international and local laws, regulations and standards. Our employees report internal violations of the Code of Ethics to their superiors. The Chief Compliance Officer, whose position was specially created for that matter, will support the senior executives when a violation has been reported. Additionally, the employees as well as business partners can apply in these cases to a person of trust that is sworn to secrecy and anonymity. Nobody may suffer any disadvantages when complying with the Code of Ethics. All employees will be informed about ethical matters resulting from every day working life. GBH Design rejects unfair business practices and acts free of corruption and bribery.